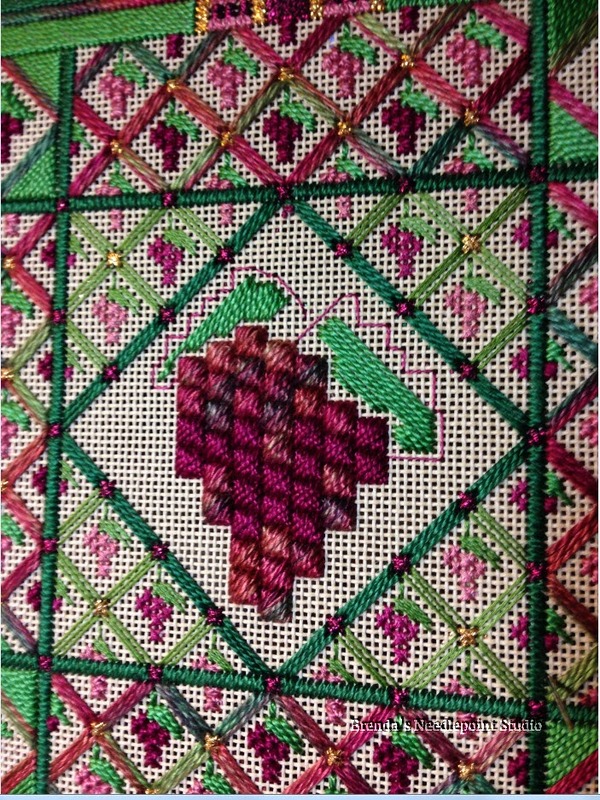 March 10, 2014--Presented this grape design to our friends at their winery in Delaplane, VA this weekend. They love it so much they fear it may be stolen if they hang it up in the winery, so may place it in their beautiful home located on the property. I would like to do another wine related project some day for them--there are so many wonderful projects out there. November 9, 2013--Fini! Now to get it framed and present it to our dear friends at their winery. November 3, 2013--Now working on Lesson 4 and am on the homestretch. The instructions call for padding under the leaves, but I found it difficult to know exactly where to place the padding. So I outlined the area where the actual leaves are stitched to see their shape, then placed the padding inside the basting. 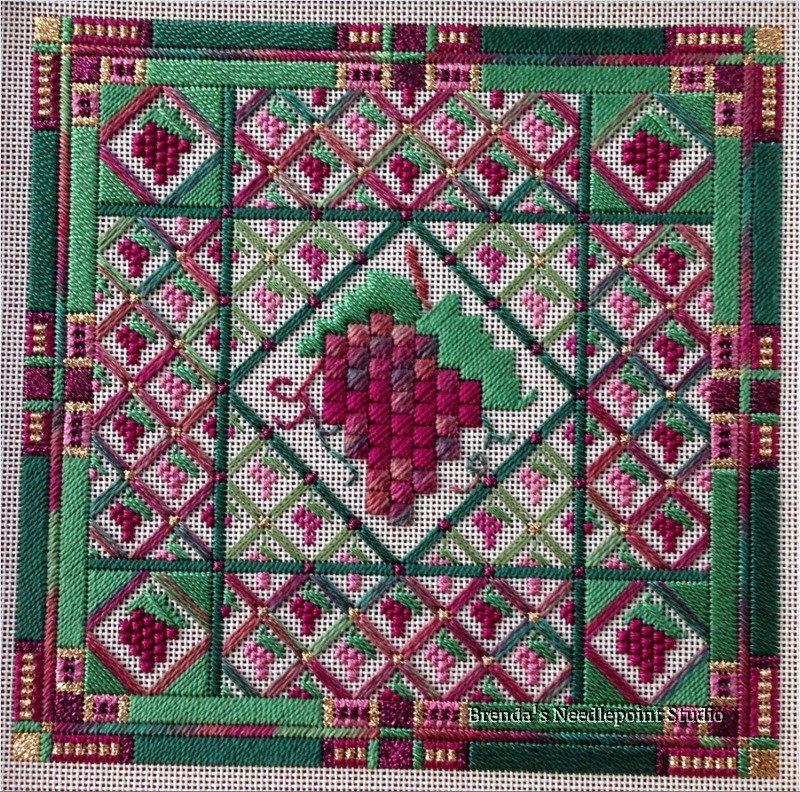 Now that's done (see both pictures below), I'm ready to finish the leaves and stems (love the varigated large grapes in the center diamond). Final pictures will be posted soon. November 1, 2013--Lesson 3 done. Love how this is beginning to look like a stained glass window. Pushing ahead now to get this finished. One more lesson to go! October 29, 2013--Lesson 2 done. 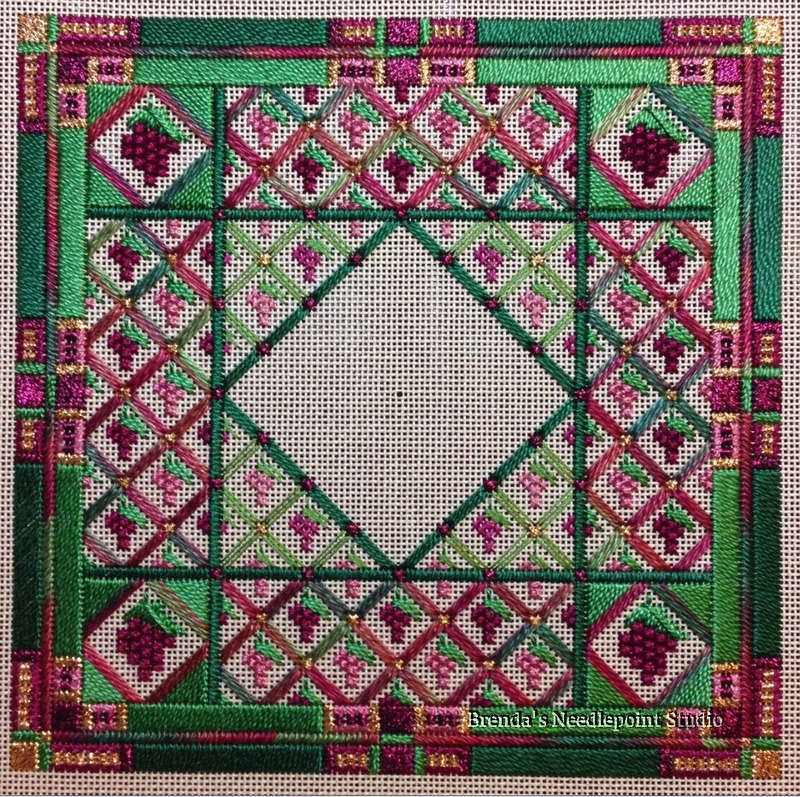 In this lesson we completed the lattice work and small grape clusters with leaves. 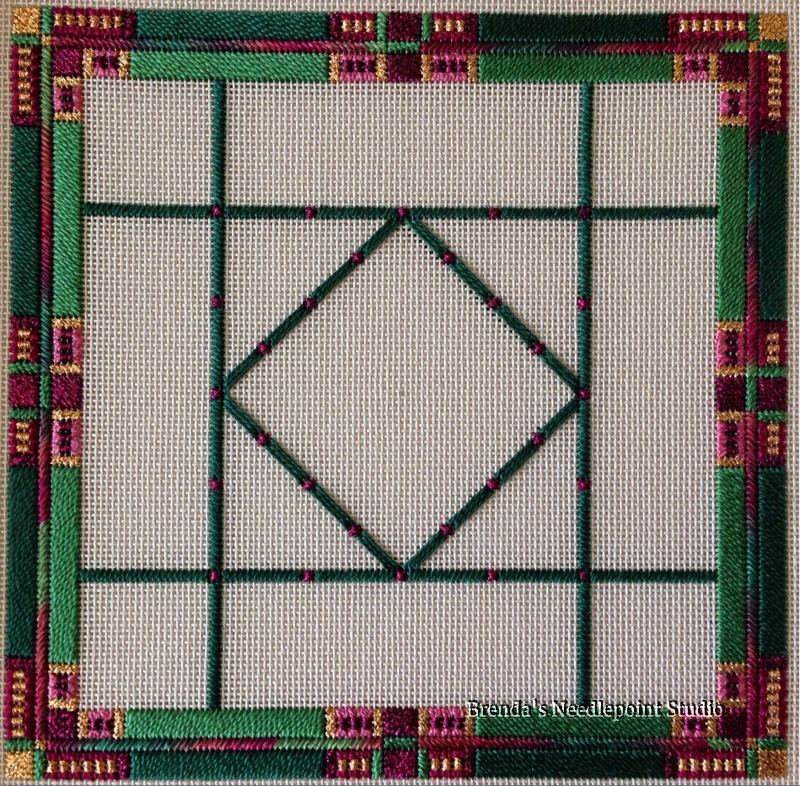 The instructions called for a finer thread for the lattice and grape clusters in the inner square which seems to make them recede. I like the effect. October 24, 2013--Whew, finished with Lesson 1. The borders are gorgeous with enough difference to be very interesting. Laura explains in her lesson that she liked the design with only the inner border, but when she added the second, outer border, everything popped. I agree. Now on to Lesson 2 covering lattice work and small grape clusters. 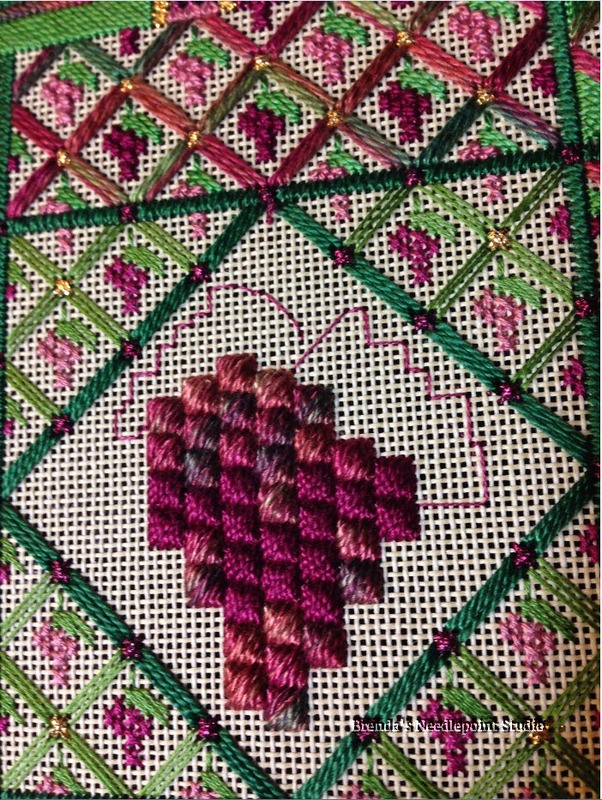 BTW, to anyone else who may be working on this project--pay attention to the slant of the stitches. The graph left border has some stitches going in the wrong direction. 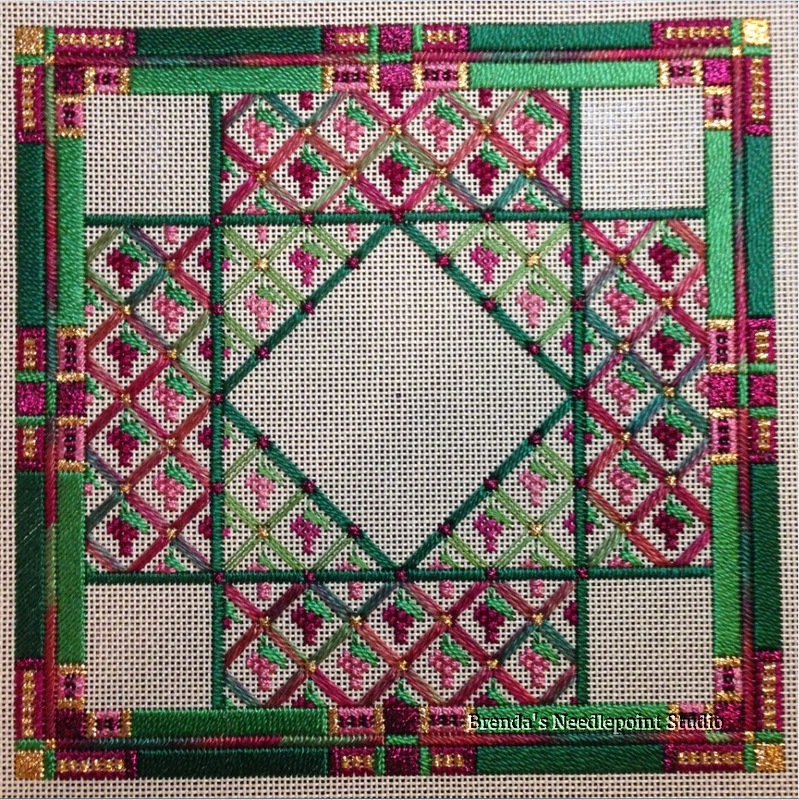 October 14, 2013--Have begun stitching Laura Perin's design called Harvest Time. This is an online LJP Cyber Class which began October 1 and has four lessons. 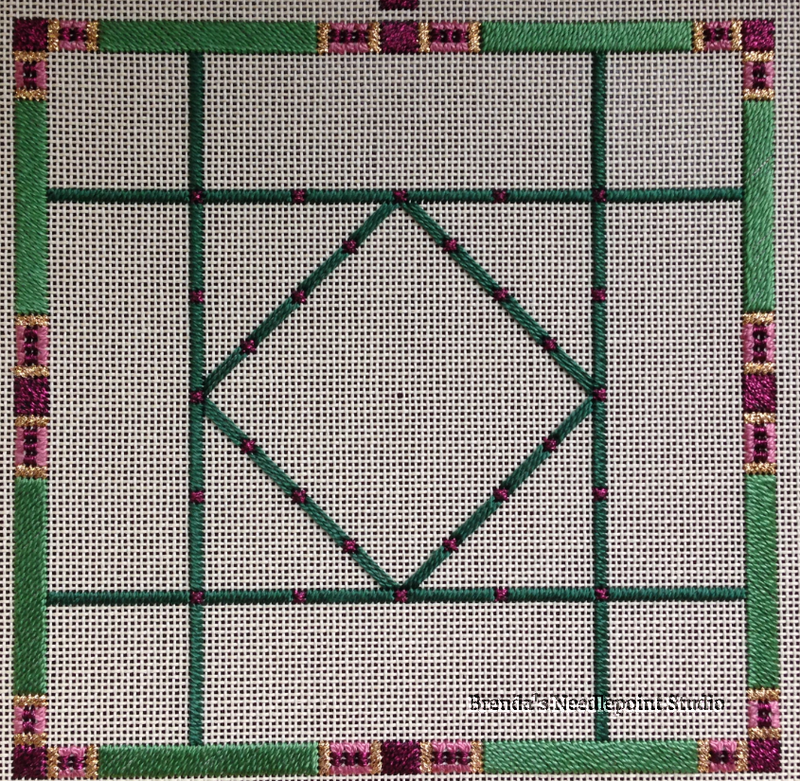 I'm nearly finished the first lesson--just need to complete the outside borders, then on to Lesson 2. When this is complete, it will be given to friends who own a winery in Delaplane, VA. They have a beautiful site with an old farmhouse which they've converted to tasting rooms on the first floor and administrative offices on the second. There are many acres of vineyards and a lovely new Tuscan style home siting on a hill overlooking the property. It's definitely a piece of heaven on earth--and the wine is good to drink too.